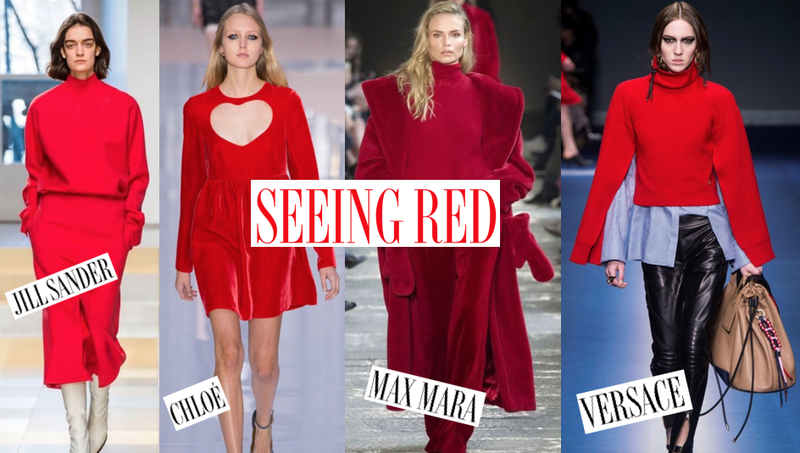 This is groundbreaking news, but I am obsessed with red this fall. I have never, I repeat, never loved the colour red. I was always way to intimidated as a child to wear it because of my hair colour! Isn't that crazy?! It's powerful, sophisticated, bold, bright and basically, screams "stop"! We're not talking muted burgundy, or oxblood, we're going full fledge power red. It is most definitetly the colour of fall and I can't seem to get enough. So how can you incorporate this power colour into the season and make it your own? Easy! 1. Accent. Does red intimidate you? Start off slow by accessorizing with the colour. A bright red lip, a killer pair of ankle booties, or a scarf can set you up to love the shade. 2. Top it up. A chunky knit with some killer statement sleeves paired with denim jeans or black leather tights will have you dipping your toes to the new hue without becoming overwhelmed. 2. Suit up! Go for a full-on monochromic look from head to toe. This look screams powerhouse and will have you turning heads anywhere. Need some more inspiration? I paired my favourite red oversized knit sweater with a faux leather mini skirt. I love how the strength of the red gets a playful touch from the skirt. It's attainable but still fun and perfect for those of us breaking into the colour. Also, there are some of my fave runway looks below! How will you incorporate the season's hottest hue into your wardrobe? Let me know! Red is having such a moment and I'm here for it! Love how you styled this look, it's touching on the trend without going totally overboard (like my next outfit post lol).